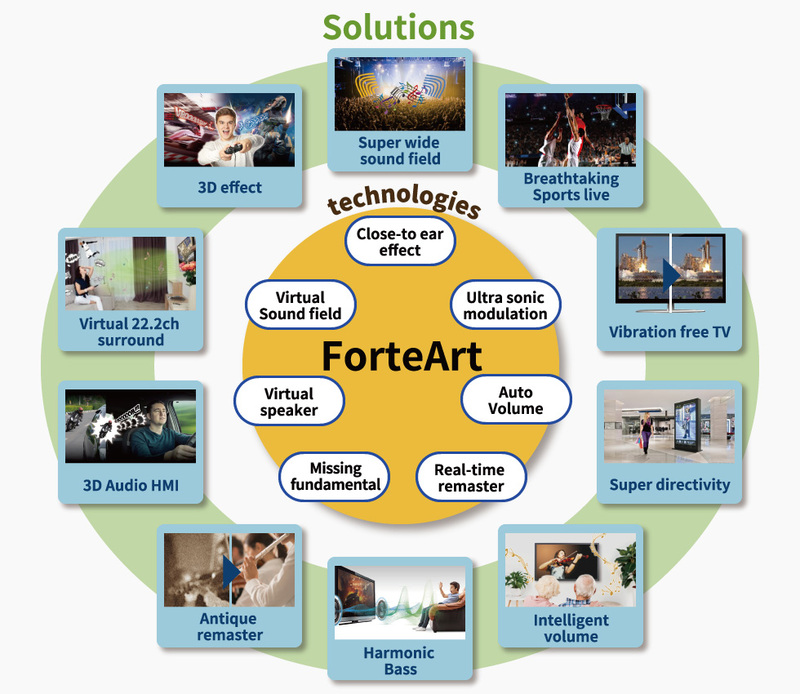 ForteArt™* , a revolutionary acoustics solution , offers a wealth of proprietary acoustics software IPs to help enhances sound-related user experience, with applications in consumer products, public signage and automotive infotainment systems. The software IPs can be implemented with other vendors' hardware, as well as with Socionext's SoC products. ForteArt is a family of solutions to address the increasing amount of broadcast and network video distribution that includes multiple sound channels such as 5.1ch, 7.1ch and 22.2ch. Because many systems include only two speakers, sound effects are often compromised and not full quality. Meanwhile, TV speakers have become thinner and smaller, making it more difficult to reproduce the ideal sound quality to achieve an immersive, realistic experience. ForteArt audio solutions address these issues. With our proprietary acoustics software IP solutions, we can solve a wide range of sound-related problems without the use of expensive audio equipment. Click here for related press release on ForteArt for solving sound challenges in consumer, automotive and other systems. Enhanced audio feature to help with those with hearing impairment. *These solutions are provided as software IP. Custom tuning of IP for specific product is also available. Contact us for more information.